All four PSAC staff unions will file notice to bargain TOGETHER today. This is a first! Our ducks are a message to the employer: the staff unions are working togetherlike never before during this round of bargaining. The ducks are fun but our intentions are very serious. Whether we work in a regional office or at headquarters, we face many of the same issues such as workload and difficulty balancing work and family responsibilities, respect for our work. We believe it is time to find common solutions to common problems. We ask that you put up this poster in a prominent place in your work space no sooner than 4:00 (EDT) today. Please keep it posted for the duration of negotiations. 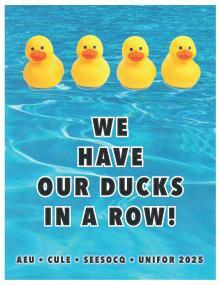 You’ll be receiving more information as the bargaining process unfolds and there will be more ducks to come. Look for upcoming bulletins on bargaining and mobilization.